One of the main things I do on my social network is to share pictures and videos with friends and family. Of course Google+ allows me to do so as well, so for today's 30 Days With Google+ post I am diving in to see how posting and sharing photos and videos on Google+ works. For starters, I clicked on the Photos icon at the top of the Google+ screen--it's the icon that looks like a couple of snapshots stacked on top of each other with a landscape picture of some trees on top. On the left of the screen are four links to view your photos and videos: Photos from Your Circles, Photos from Your Phone, Photos of You, and Your Albums. Photos from Your Circles is just an eclectic jumble of random pictures. I like to see the photos shared by the people in my social network, but I don't really see the value of presenting them this way. 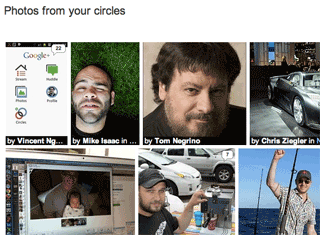 The "Photos from Your Circles" section of the Google+ Photos page shows a random, eclectic collage of photos…well, from my Circles. It has some appeal--like surfing Flipboard, or browsing Pinterest--but, it does not seem to be a practical way of engaging with the social network. It seems more like something I might use out of boredom just to kill some time, but in general I am likely to just see the photos from my Circles when the people in my Circles post them to the Stream. The Google+ Photos page has a link for "Photos from Your Phone", but the feature only works with Android smartphones that have the Google+ app installed. For those who have an Android smartphone, and have the Google+ app installed, it can be a pretty cool feature. Basically, every photo taken with the Android smartphone is automatically uploaded to this folder on Google+. There are two benefits to this. First, the photos are available for instant sharing on Google+. Second, if the Android smartphone happens to get lost or stolen, there is already a backup of all the photos on Google+. A third potential benefit is that if the Android smartphone is stolen, and the thief is dumb enough to start snapping pictures without realizing that they are being automatically uploaded to the Google+ folder, those photos might identify the thief or provide clues that help authorities track him (or her) down.